I'm giving him a 100% grade for his speech in Tagalog. Pinoy na Pinoy! As expected in every president inaugural speech, there are always parinig or innuendo in Spanish about the outgoing president. If I were Pres. GMA and I was listening to it personally, I would have melted right away or walked out. Hmm, speaking of her, why is it her name was not acknowledged on the speech when the other past presidents were? Very light and detailed... that's how he tacked the issues he is most concerned of. Corruption is still at number one spot. Sigh, when would be our country be free from it? Bawal na ang Wang-wang! This is the only issue that never crossed in my mind a President would be so much concerned of. Kayo ang Boss ko! I Like this line! Really, really glad to be part of Inauguration of the 15th President of the Republic of the Philippines at least in front of the TV. 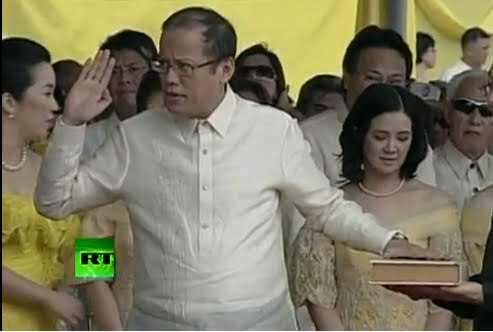 Please do not frustrate us in the 6 years to come P-noy!